The Stihl RT4112 S Ride on Mower 110cm with side discharge is ideal for lawns up to 8000m². The side discharge deck distributes the grass clippings across the lawn during mowing, perfect for less formal lawns where grass collection is not needed. 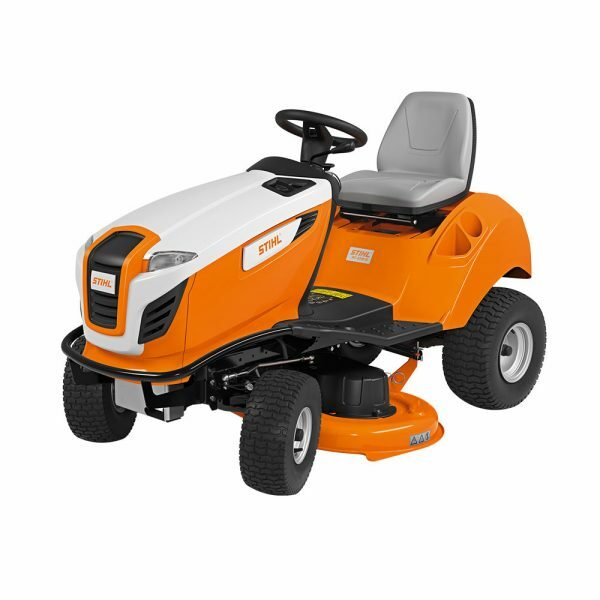 The RT 4112 S comes with a wide (110cm) deck to reduce the time you spend mowing the lawn. As the ride-on mower does not need a grass catcher box it is very compact in size and extremely practical, especially if you want to cut your lawn with speed and efficiency. With the single pedal drive you can simply switch driving directions using the hand lever, which makes it easy to manoeuvre, even in more confined gardens. The low step and ample legroom provide a high degree of driving comfort at all times. The driver’s seat can be adjusted tool-free and, like the ergonomically shaped steering wheel and the easily accessible controls, supports relaxed working. The mowing deck blades can be easily engaged and disengaged simply pushing a switch on the control panel. The RT4112S comes with a 5 year extended warranty (subject to registration and annual servicing). The lever to adjust the deck cutting height is located directly next to the driver’s seat. It enables individual adjustment of the cutting height in up to eight steps. Mowing with side discharge allows large lawns to be mown in a short time. This is due to the clippings being ejected directly onto the lawn and not having to empty a grass catcher box. The most comfortable seat position can be set without the use of tools. This allows individual adjustment of the driver’s seat to almost any body size.